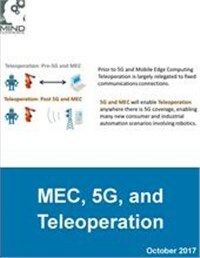 This research evaluates the technologies, companies, solutions and market outlook for MEC, 5G, and Teleoperation. This research also evaluates the impact of 5G in IoT across infrastructure components including hardware, processors, embedded devices, software, and cloud-based service platforms. This research also analyzes Teleoperation (operation of a machine at a distance), tele-robotics, and other areas that rely upon interface and control of real objects by virtual objects. It includes detailed forecasts through 2017 for each technology and related solutions, applications, and services.